A major new power station is being delayed for up to a year after concerns about rusty pipe work within the site. The £400m power station at Langage near Plymouth had been due to start generation this past winter but that is now not expected until the end of 2009. Local MP Gary Streeter, who was told about the delay by workers, said he was concerned about safety and 2,000 jobs on an adjoining business park. Main contractor, Alstom, said revisions of large projects were "not unusual". Centrica's Langage plant will provide 885 megawatts of electricity, enough to power about a million homes. It will have a business park - a so-called "energy park" - next to it which developers said would provide 2,000 jobs. But work has not started on the business park site yet and south west Devon MP Mr Streeter said: "I have concerns about the health and safety of workers. "But I am also very concerned about the energy park. "I have been told that they cannot get that up and running until the power station is on line. "There are 2,000 jobs at stake so this delay is costing us." He added: "I hope that this is not not one of those Titanic-type projects that nothing goes right." The main company building the power station, Centrica's main contractor, French engineer Alstom, said: "As is the nature of large, complex projects, revisions of the program are not unusual." 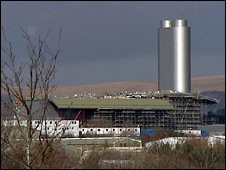 The power station was affected in August 2008 and in February 2009 by wildcat strikes over the replacement of British labourers with foreign workers. The power station will be operated by Centrica which has seven other gas-fired power stations in the UK. It is one of a series of new power stations to address an energy shortfall as older nuclear and coal-fired plants wind down.